How much does it cost to travel to Cordoba? How much money will you need in Cordoba? AR$1,881 ($45) is the average daily price for traveling in Cordoba. The average price of food for one day is AR$521 ($13). The average price of a hotel for a couple is AR$2,004 ($48). Additional pricing is in the table below. These average travel prices have been collected from other travelers to help you plan your own travel budget. How much money do I need for Cordoba? Cordoba is the capital of the Cordoba province and the second largest city in all of Argentina. The city is in a beautiful setting surrounded by valleys and hills. Within the city you will find many colonial buildings and beautiful architecture. Cordoba also has many universities and scientific institutes, giving it the nickname "La Docta." Because of the large number of students, Cordoba's population is young and active, which keeps the atmosphere light and fun. Cordoba's climate is humid subtropical with four distinct seasons. Summers are from late November through early March and temperatures are usually in the 90s Fahrenheit, but can climb above 100 degrees Fahrenheit. Fall is from early March until early May and temperatures start to drop. The weather is drier and frosts can occur in May. Winter is from late May through early September. Highs are usually in the 60s Fahrenheit, but weather can be unpredictable. Spring is highly variable and windy, and droughts are common during this season. Spring is between September and early November. Cordoba has a wide variety of sights throughout the city and is famous for its colonial style architecture. Many of these buildings were built by the Jesuits in the 17th and 18th centuries. The Manzana de los Jesuitas is a block of these buildings that runs between 27 de Abril, Obispo Trejo, Caseros and Av. Velez Sarsfield. 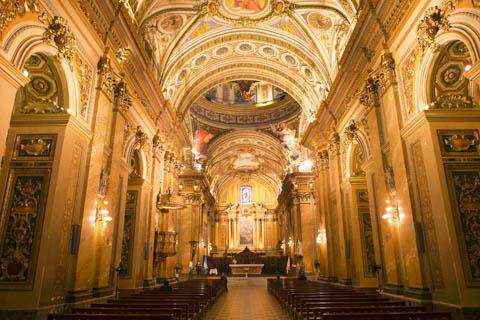 Cordoba also has many famous and beautiful churches. These include the Cathedral, Iglesia Sagrado Corazon, Iglesia de Santa Catalina de Siena, and Monasterio de Santa Teresa, Iglesia de San Francisco, Compania de Jesus, and Iglesia Maria Auxiliardora. Other architecturally impressive buildings in the city include Palacio Ferreyra, Palacio Municipal, Cabildo, Palacio de Justicia, Ex Rectorado de la Universidad Nacional de Cordoba, Colegio de Montserrat, and Banco de la Provincia de Cordoba. There are also countless museums throughout the city that focus on the arts, science, technology, and history. Parks around town include Parque Sarmiento, Parque Las Heras, Parque de la Vida, and Parque San Martin, among many others. Cordoba is a large city with 1.3 million residents in the city proper. The city has a variety of neighborhoods each with their own character and personality. For the most active nightlife, head to the areas of Guemes and Alta Cordoba. The city center has a combination of historic architecture and modern buildings. For the most beautiful buildings, go to the areas around Plaza San Martin, the Nueva Cordoba district, and the area around the Canada. The Barrio Guemes is a particularly beautiful area that is protected by municipal law. Cordoba is rich in culture and there are more than 50 theaters around town. There are also countless museums, cultural centers, and "arte bars" where you can see live music or art exhibits. Sports are also active in Cordoba. There are plenty of locations where you can participate in sports such as soccer, basketball, hockey, or even mountain biking. There are also soccer teams, a basketball team, and several sporting venues where you can cheer on the local teams. Every other year Cordoba plays host to the Festival de Teatro del Mercosur. This is Argentina's most important theater festival. There are some great restaurants in Cordoba, with no shortage of budget options that cater to the many students around town. Most of the city's restaurants can be found in the Cerro de las Rosas area, along Avenida Colan and also in Nueva Cordoba. Budget options include sandwiches, kebabs, pizza, and even hot dogs. You can find both traditional foods as well as international restaurants throughout the city. Chinese, German, Italian, and Asian restaurants are all available, among many other options. Fine dining restaurants also offer international flavors or even a modern twist on traditional Argentine cuisine. The only form of public transportation in the city is bus, as the tram system was shut down in the 1960s. The buses are divided into different "corridors" which are named with colors. Bus rides cost approximately $2.00 and must be paid for with a specific bus token or bus card. Sometimes the driver will accept cash if you request. You can also easily catch a taxi to make your way around town. A fifteen block ride should cost you approximately $6.